The Heil SM1 shock mount is a unique design. 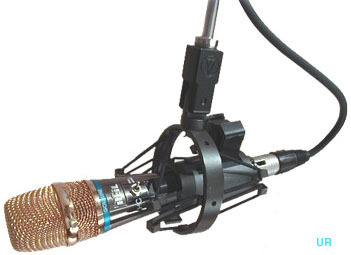 The mic clip is suspended from 8 points using a neoprene elastic cord assembly, suspending the microphone from a direct mount, thus isolating the low frequency acoustical coupling to your desk. It can be used with all booms or stands. The microphone shown is not included. Copyright 2004-2019, Universal Radio, Inc.